Chicken Mussamun Curry with Durian. A durian by itself is already something. But in Chantaburi – as Thailand’s tropical fruit haven – they are ahead of the curb. Instead of just showcasing their abundance ‘king of fruits’ in fresh and preserved forms as much-expected, they make a good, salacious curry out of it. 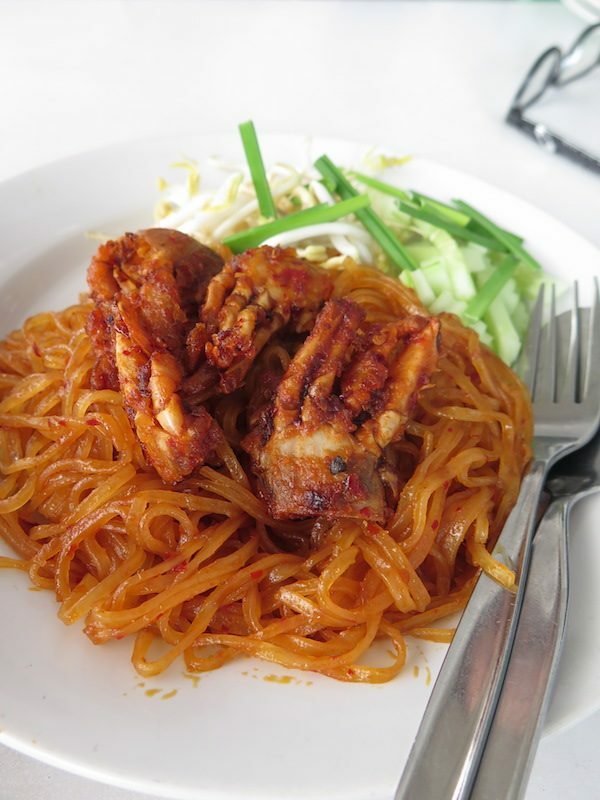 Chantorn Potchana ร้านจันทร โภชนา is a long-standing restaurant in Chantaburi town. This is a place where one can enjoy Chantaburi’s fruits in savoury forms. 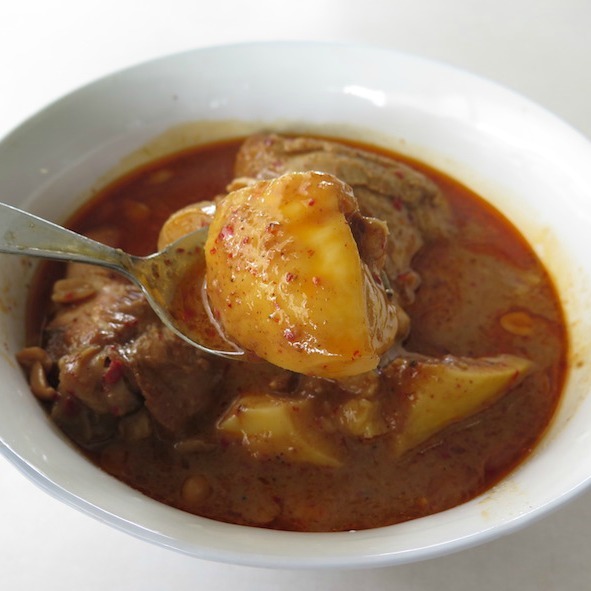 One of the most popular items on their menu is massaman curry with young durian (pictured). 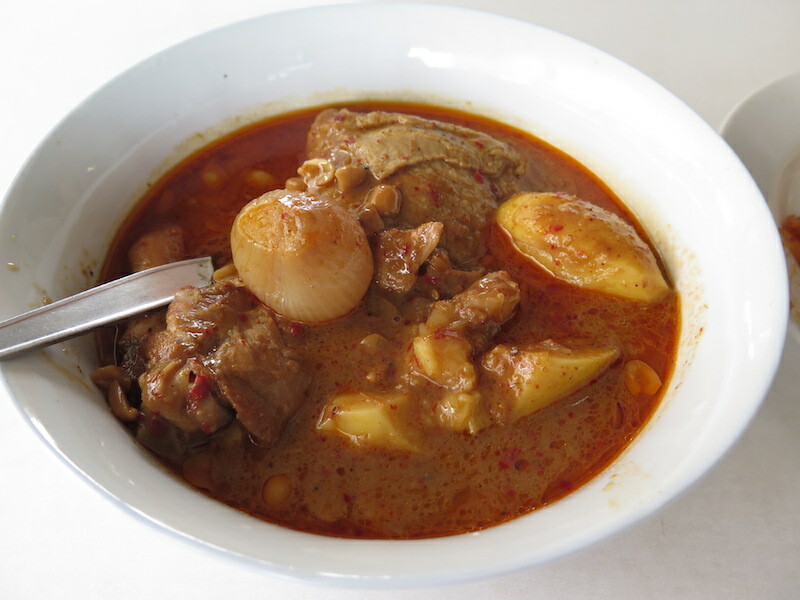 Massaman is a Muslim curry that we Thais adopted into our delicious repertoires. And because this curry’s religious origin, any adaptations of the bowl would never include the use of pork. We can do chicken, beef, lamb, mutton, but never pork. Durian massaman at Chantorn Potchana is chicken. But instead of potato, they use young green durian instead. Young green durian, when stewed in the thick curry, gives a munchy texture, not unlike the potato. Only firmer with a slight unique fragrance of durian. Not too much, though, just about right. So, this is a perfect bowl with a clever combination of the local fruit. A must try if you are in Chantaburi. 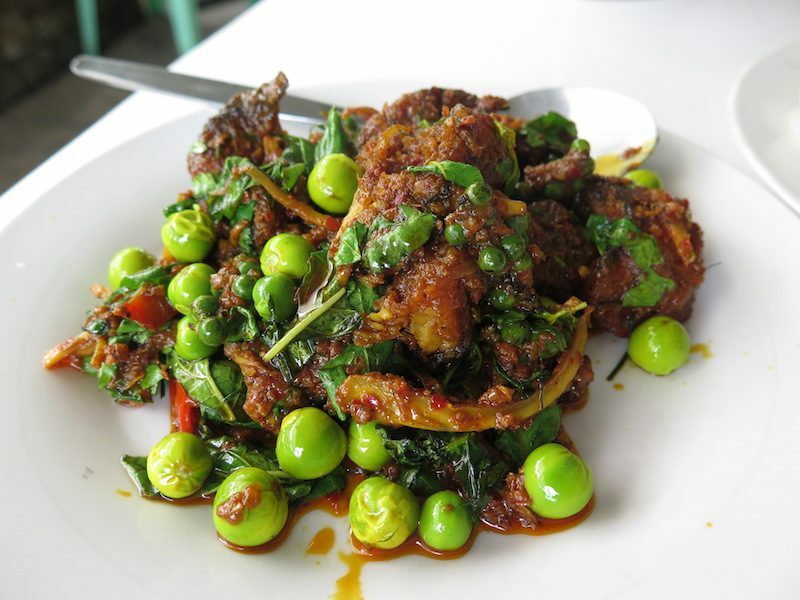 But apart from the massaman, Chantorn Potchana also serves a myriad of deliciousness. Some are so particular of Chantaburi, too. For example, this lovely mangosteen salad. And much much much more. Please read the captions. 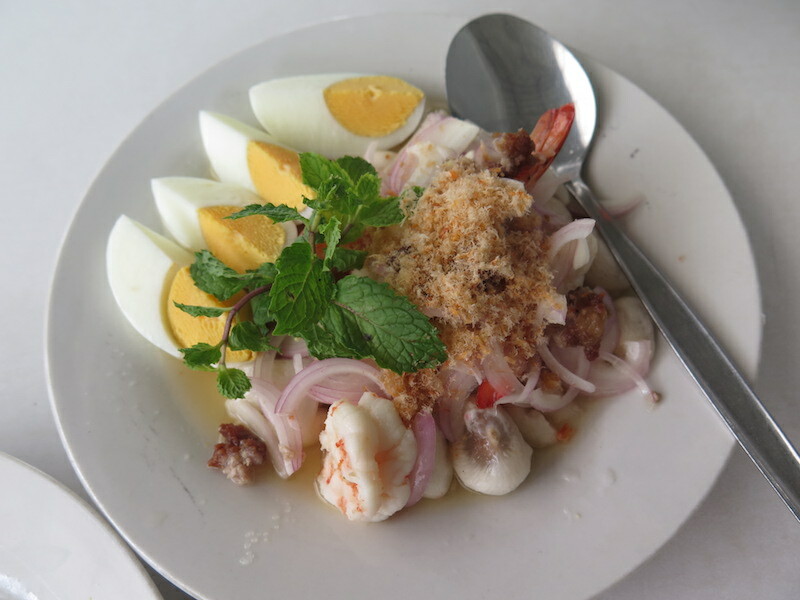 Above: Mangosteen salad with shrimp, minced pork and a drizzle of dried shrimp. 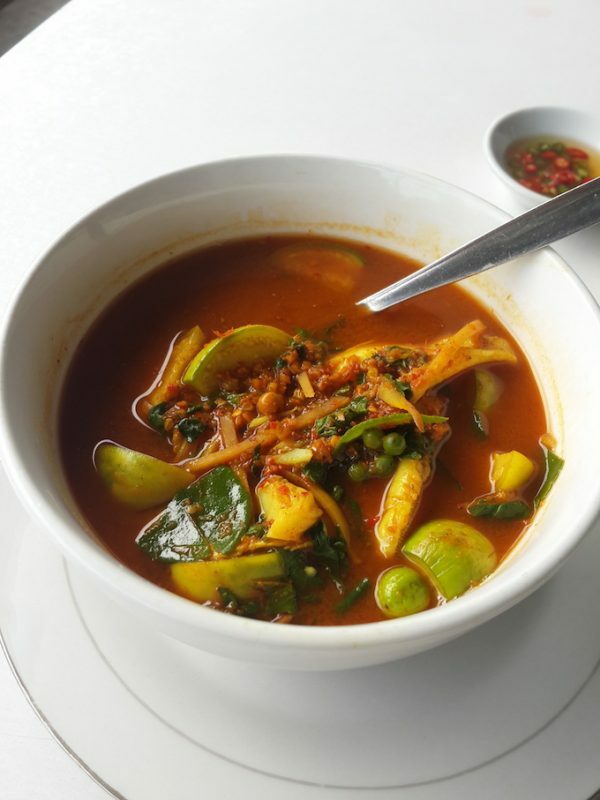 Savoury, a bit spicy but also tangy and well-rounded. Above: Delicious dry curry stir-fry of catfish with Chantaburi’s own curry paste with galangal roots. Delicious. 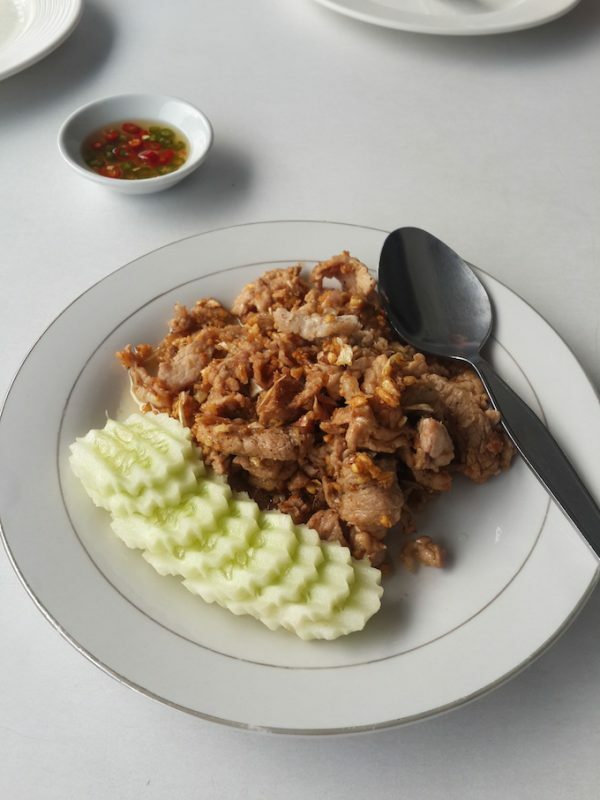 Above: A simple dish of garlic pork. Great with steamed rice. 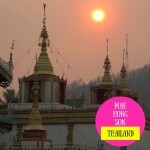 Above: Provinces along Thailand East Coast is known for their ‘wild curry’ or fiery light curry with seafood or gaeng pa. This bowl is with ‘Pla Heb Kone’ and loads of herbs. Very spicy but also very good. 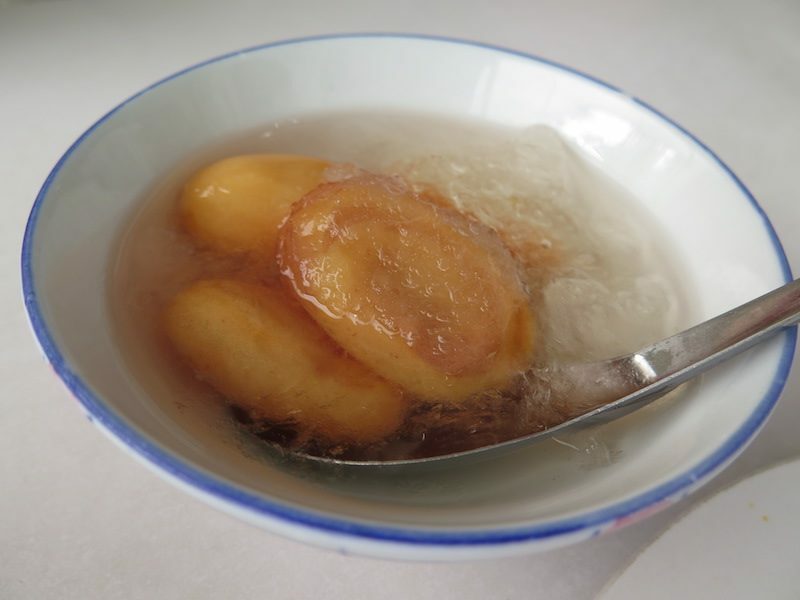 Above: Sala or salacca – a native fruit of Chantaburi – preserved in light syrup, served frozen and very fragrant. Perfect for the province’s perennial tropical heat. 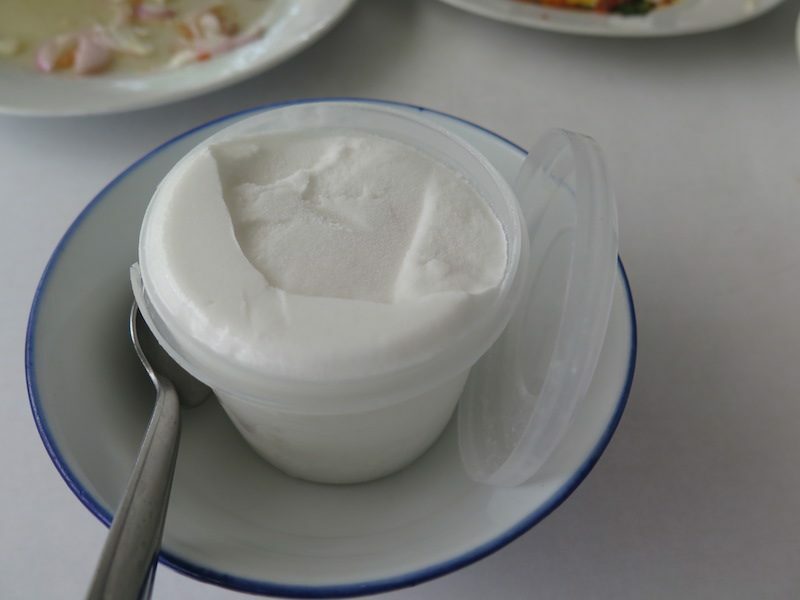 Above: You don’t need to travel all the way to Chantaburi, but here we are enjoying a pack of coconut ice cream. Chantorn Potchana has two branches. They are open daily from 10.00 – 21.00. © OHHAPPYBEAR. all rights reserved.